I was not quite sure how I can execute the compliment device, like what the input could be. I was thinking emotion, and I found few API about detecting emotion from face. Another solution I thought of is Instagram data from the user. Maybe user can enter three key words to describe themselves. Maybe the compliment can generate from user’s hand size and weight. Collaborated with Yuanyuan Wang, we also thought of another idea. We wanted to build an installation that is beautiful and magical. The flower like creatures in the right picture is hanged from the ceiling, and they would move up and down. The little creature can also be like a butterfly as the other drawing in the picture. There will be maybe 30-40 of these little creatures. When user puts their hand underneath the installation, the creatures would fly up and down and lights up based on where the hand is. From this semester’s projects, I have noticed a theme in my works. I enjoy bring joy to people in a unique way, using medium such as compliment, dance, magic, and cats. A side project I am doing now is my compliment project. I provide service to people. One of my most popular service is to compliment clients one time a day in different ways each day. User can reserve a period of time, for example, a week, a month, or less than a year. So, I would love to bring in compliment into my pcomp final. Also, I have been working on cat and dog in my ICM a lot. Collaborated with Anna, we made an animal DJ set and cat dog star wars. So, I was thinking to incorporate cat and dog into my pcomp final to make things more funny and cute. Based on the above inspiration, I came up with this rough idea, a device that generates compliment from hand sensing. When user puts his/her hand down, the sensor sense temperature or some other elements, and generate a compliment based on that input. I was interested in making a visual image using multiple LEDs. I thought of the word “Hi”, because this is like my Hello World project in electronics. I found this tutorial on Youtube: https://www.youtube.com/watch?v=WXZoxG799Nc. From here, I had a vague idea of having LEDs on parallel circuits. Then, I started to think about how much resistor I need, and all the calculation seems confusing. If the LEDs are in the same column because that is the image I want, then it would be series circuit, what do I do? 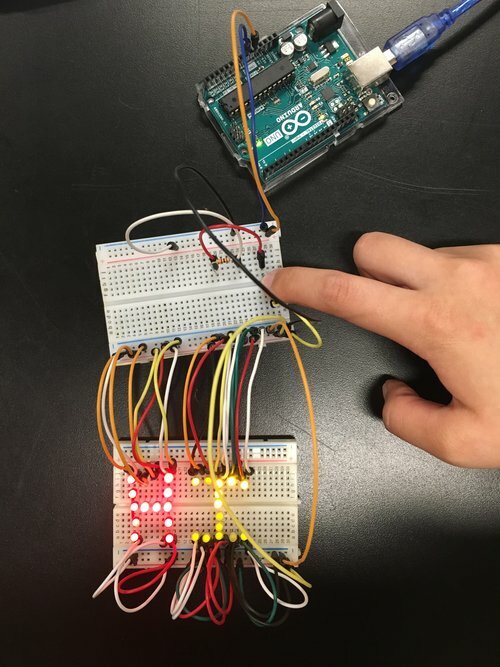 How many LEDs can a 5V circuit support? I started from somewhere I felt most confident about, which is to layout the LED in the visual form I want. It seems like some will be in series because they are in the same column, and some do not have other lights in their columns. It seems like a complicated circuit… By now, I felt I had a slightly clearer idea of the circuit but still not sure how this would work. I felt I needed a resistor, a switch, and then the circuit fans out into many parallel lines. I asked an ITP friend, Chengchao Zhu (CC), for help. We realized that we might need many jumpers going everywhere, and the LEDs might even be covered underneath jumpers. To achieve better visual installation, our solution to this problem is to bring in another breadboard. An important thing I learned from CC is utilizing power rails. All LEDs connect directly from the power rails of the other breadboard. I also learned that the four pins of a switch cannot be connected to each other in the same column. Also, to connect a switch, I need to connect its diagonal pins. Why is that? After making these LEDs work, I started to realize that I had an impulse to say hi to people using this installation. Although it was difficult to carry around, this could be an alternate to greet people without verbalizing. There is actually one LED that did not light up. I realized that column was not working. Was it about the breadboard? How do I troubleshoot that? This was also the limitation of this circuit: it was not easy to change it around because I would need to move everything.